Beautiful quilt! Very well made held up to several washing’s . Warm and comfortable . Classic Laura Ashley pattern, offers soft blue and grey color of this three-piece quilt set will give your bedroom a classic vintage look. The 100-percent cotton set features a light blue floral pattern on a grey background and striped pattern on the reverse side. 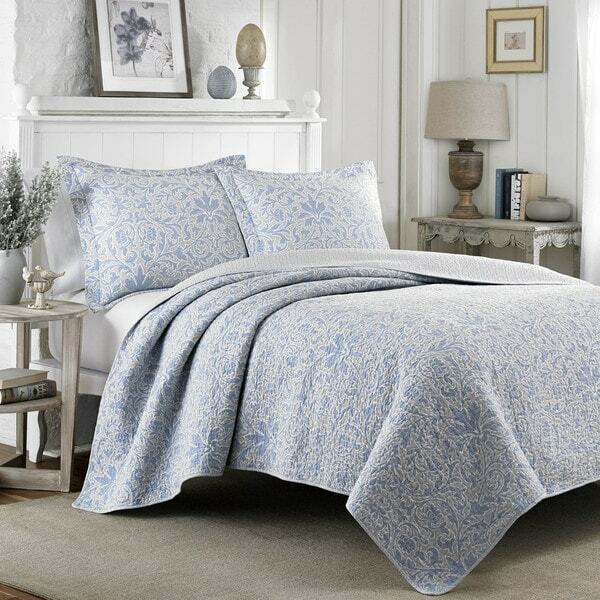 Create a calm and peaceful atmosphere in your bedroom with this cozy quilt set. Quilt is reversible to subtle tonal print. Prewashed cotton, adds softness and prevents shrinking. Layer with our Laura Ashley sheet sets to complete the look. Set inlcudes matching shams (One (1) Sham with Twin size). I purchased the king sized quilt. The colors are soft and lovely. There was a little shrinkage after washing. It is light weight and does not add a great deal of warmth to the bed but I bought it as a summer quilt so that is ideal for my purposes. I would buy it again. Love the soft colors (blue/gray/white) and the texture. Fit our bed perfectly then after washing in cold water it shrunk slightly and now doesn't cover the sides enough. I love this quilt set!!! The color's are a soft blue and grey. I love the pattern on this quilt. It is soft and light in weight. It washes and dries very easy. I bought the full/queen size. The pattern and colors are quite pretty, but the shams were not cut properly with the pattern. The pattern is centered on one of the shams, but it is totally offset on the other. This creates a sloppy look that screams "these linens are factory rejects." I am hoping Overstock will send a replacement sham. The quilt set is beautiful. The quilt is not heavy weight or too light weight. Very comfortable. The design is delicate and perfect for the guest room. The grey background is pale and does not take away from the blue. We have an antique iron bed with decorative swirls in both the headboard and footboard. The quilt works perfectly and gives the appearance of a vintage ensemble. I am quite pleased. Good quality for a great price. Beautiful shades of pale blue and grey. Reverse side is pale blue and grey pinstripes. Soft comfy cotton. Serene! LOVE IT!! I really liked this quilt set. Until my dog got sick on it. I washed it in cold water & dryed on Permanemt press cycle and the quilt shrunk by several inches in all directions. I guess I should have bought the King size for my Queen bed. Now the King size is no longer available. The Laura Ashley Quilt and Shams are very nice! Colors are exactly as pictured! Soft and lovely on the bed! This is a beautiful, well made quilt. The colors are true to the picture and it's lightweight and very soft being cotton. Laura Ashley is such a constant good quality brand. I'm very happy with the 2 sets I got. This is a beautiful quilt and a very good price. I absolutely love this quilt because of the color, size, quality, easy of laundering. I purchased the king size for my queen size mattress. It drapes over nicely and acts as a bedspread. Love these quilts! I followed other recommendations and got the King size for my queen beds to allow for shrinking. I haven't washed them yet so I'm not sure how much they will shrink. 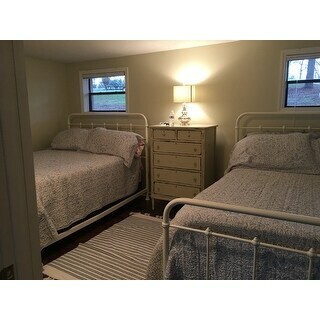 The colors are soft and muted and beautiful for a guest room at our Lakehouse. The quality is excellent for what you pay and I felt like I made a great purchase! This is made of high quality materials, and is very pretty. I have no doubt it will stand up well after multiple washes and with two fat dogs digging to China every night. Love the quality and the blue and white colors. We are using this for our beach house and although I haven't yet used it, it looks like it will wear well. Awesome quilt! I bought one for my bed and came back to pick up another I love it so much! It’s super soft and fits my king sized bed perfectly! You can’t beat the price! I love the quality and design, but wish it were just a tad bigger. I have an extra thick full size mattress and ordered the queen/full size. Cute pattern and nice quality. Washed and dried and came out great. In case you’re looking for a heavier quilt, this one is pretty light weight. Happy with this purchase. "I purchased the Mia recently in king size for my queen size bed. I love how it looks, except that I can't use the king shams...way too big for the queen bed. I am planning on ordering the MIA blue\gray. Can the shams be ordered separately so I can have standard shams with my king quilt?" Unfortunately no, shams cannot be purchased separately. "Is there a shower curtain that matches this quilt?" "Is there any white in this quilt. My headboard is cream, and I do not think white would look good on the bed. Help!" "Is this made of cotton or polyester?" Cotton-it's nice and soft too. "What is the fabric color on the reverse? Thank you." It's a pale blue/grey stripe. Looks similar to old fashioned ticking. Very pretty and tasteful. "Is the blue a purple/blue? How would you describe the colors in this quilt?" In my opinion this set is a light blue color. I wanted some soft color in our master bedroom in a quilt for the summer. This looks so pretty I thought I'd give it a try. Color, design, and fabric. I wanted 100% cotton, not polyester.